Googles Places, Instant, May Day Update, Caffeine and More..
Have you noticed that Google has introduced some major changes this year? I used to think that if you did the right things: 1) have a well optimized site and 2) build quality links to that site, that was all you needed to care about. While that is still true, the Google landscape is rapidly evolving and we need to pay attention. First we saw the May Day update (appropriately this update occurred around May 1st, 2010). While Google is constantly tweaking it’s algorithm, periodically there are major algorithmic changes that many noticed. In this case, the major impact was to the long tail search. It used to be that you could rank pretty easily for a long tail search by just slapping a website up optimized for it. Long tail searches are those searches with many words (ie. four, five, six words). With May Day, that’s not as easy to do, as Google now pays more attention to a site’s authority and quality even in the less competitive long tail arena. About the same time we also had Google Caffeine. This was an infrastructure change for Google that allowed its search spiders to work faster, so “fresher” results could be provided to the searcher. Webmasters noticed that more pages of their sites were being crawled by Google. As Google had warned it would in the previous year, it started paying a lot of attention to page load speed. If you have Google Webmasters Tools set up for your site, check out the page load speed report (under the “Labs” menu) … is your page speed faster than at least 50% of the other sites on the web? Have you noticed that Google is now providing results as you type into the search box? This is called Google instant. The question then becomes whether this will impact searching behavior. I’ve noticed it impacting my searching in certain cases, especially if I’m not clear on what I’m looking for. If I see that there is a particular subtopic that I hadn’t thought about but is relevant to what I’m looking for, yes I would be likely to chose the search Google is suggesting. Local business should take note of the more recent change. Google Places (previously named Google Local Business Center) has just had a major update. The most obvious change is no more “7 pack” (those results that look like a list of map locations). The map and the little balloons are still there but the “local” results now look more like the rest of the results. This does mean that the “local” results take up more of the page, signifying Google’s increasing commitment to local business. If you are a bricks and mortar business and haven’t paid attention to Google Places before, you need to know. And those of you that are a local business but not a bricks and mortar, you can still list in Google Places with its new concept of “Service Area”. Quality and Authority are important, Google continues to wage war on those that would try to game the system with spammy sites. Sites that have unique and fresh content and that demonstrate authority (by having other high quality and relevant sites link to it) are favored by Google. I think the other thing I would like to point out here, is I think Google’s philosophy has shifted here. It used to be about the sites that were the most popular, now Google is recognizing that many searches have commercial intent and catering to those searches. Additionally it is providing different types of results mixed in on the results pages. There is the listings for local businesses as we discussed above. But have you noticed as well “Google Shopping Results” and “News for …”? 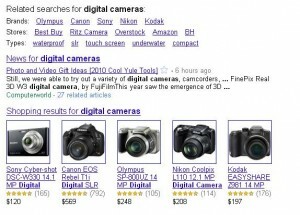 In the results above for “digital cameras” note the “Brands”, “Stores” and “Types” links. I’m not sure when these links crept in, but interesting eh? Particularly for those selling into a niche market, the “types” links would be worthy of further investigation.